Your one-stop resource for clinical trial regulations, guidelines and best practices. The Guide to Good Clinical Practice is your one-stop resource for clinical trial regulations and guidelines — everything you need to conduct clinical trials more effectively, streamline the process and ensure human subject protection and trial data integrity. This resource is THE most comprehensive and straightforward resource of its kind. The Guide to Good Clinical Practice provides sponsors, institutional review boards (IRBs), clinical investigators, monitors and study site staff with the information and tools they need to conduct quality clinical trials of new drugs, devices and biologics. From explanations of laws, federal regulations and international harmonization efforts to an analysis of accepted good clinical practices, the Guide helps clinical researchers avoid costly errors and gain faster product approval. The Guide to Good Clinical Practice includes sample checklists for conducting quality assurance audits, FDA forms, industry guidance documents and information sheets, monthly newsletters, updates, news and analysis on key developments in conducting clinical research, and additional resources. Guide to Good Clinical Practice brings the very latest clinical trial regulations and guidelines to keep your trials in strict compliance. Order today – not knowing can be costly! 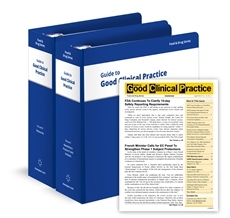 You will receive the two-volume Guide to Good Clinical Practice in print and/or access to the manual online at fda.complianceexpert.com. Based on the delivery method you choose, your annual subscription also includes quarterly print and/or rolling digital updates, news, analysis and more at no additional charge for the 12-month subscription period. Additionally, online subscribers receive access to our FDA Enforcement Letter Database as well as our Clinlaw Database, which provides comprehensive information about laws and regulations governing clinical research for all 50 U.S. states plus the District of Columbia. If you have any questions or would like information about bulk pricing or site licenses, please contact Client Services at 800-677-3789 or by emailing service@thompson.com. Mary Bernadette Ott was a regulatory affairs and quality assurance consultant specializing in establishing in-house good clinical practice auditing programs for sponsors, conducting audits at clinical investigator sites and training sponsors, contract research organizations and clinical investigators on FDA and international good clinical practice requirements. Formerly, she was an FDA field investigator in the agency's Philadelphia District Office and a supervisory investigator in its Boston District Office. She received a B.S. in biology from Chestnut Hill College in Philadelphia.